One of the first settlers on the Marblehead Peninsula was Benajah Wolcott of New Haven, Connecticut. He enlisted in the army at 14 and served until 1784. Without land or a trade or profession, he worked for others until 1806 when he was hired to work on a survey team assigned to map the western most edge of the Connecticut Western Reserve. The survey team was headed by Moses Cleaveland, the man that Cleveland was named after (Cleveland was originally spelled Cleaveland, but was changed by a newspaper that needed to shorten the name to fit on their masthead). This Sufferers Land or The Firelands, along Lake Erie, would be given to Connecticut people who had been burned out by the British during the Revolution. After completing the survey, Benajah returned to Connecticut, but was determined to return to the area. In 1809 he bought 114 acres on what is now called the Marblehead Peninsula. 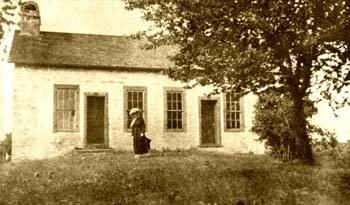 He brought with him his wife, 3 children, and 2 hired men and together they built a log cabin near the site of the present stone house. In 1812, fearing attacks by British and their Indian allies, the Wolcotts fled to Newburgh, on the Cuyahoga River. 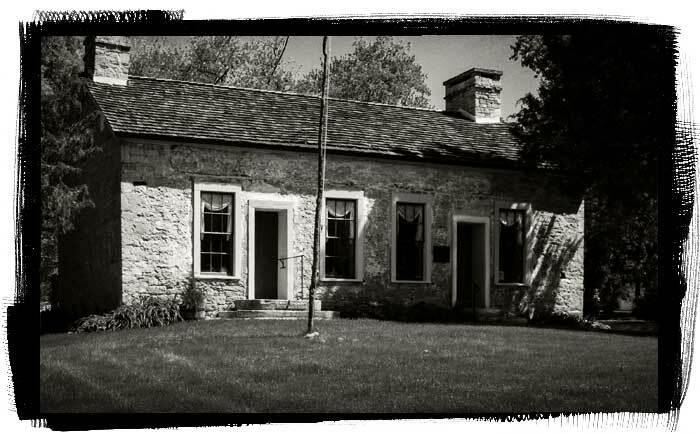 In September of that year, just after the Wolcotts abandoned their home, a large contingent of Indians, came ashore and fought the first skirmish of the War of 1812 on Ohio soil about 1/2 mile west of the Wolcotts's House. At the time there was a small militia unit stationed at Fort Avery, a stockade on the Huron River just north of Milan. These troops and local civilians fought a contingent of Indians on the Marblehead Peninsula. This was one of the few skirmishes in the state. Almost everyone left the Firelands due to the Indian threat and there were at least 8 civilians murdered in raids between 1812 and 1813. While the Wolcott’s were away, Benajah's wife, Elizabeth, died at Newburgh during the war. Commodore Perry defeated the British at Put-in-Bay in 1813 and ended the conflict in the area making it safe for residents to return to the Marblehead Peninsula. Wolcott and his children moved back to their log cabin. In 1822 he was appointed keeper of the newly completed lighthouse on Marblehead. Benajah Wolcott, it would seem, had two homes, one at the lighthouse and one which he had built by William Kelly, the stonemason who built the lighthouse, at his farm 3 miles away for his new bride Rachel Miller. This house was built of limestone from an early quarry a short distance from the back of the house. 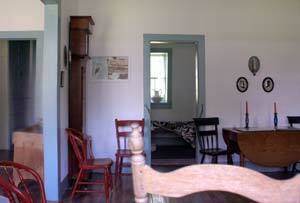 The Wolcott House is an excellent example of early domestic architecture in the Firelands. Benajah Wolcott was keeper of the lighthouse until his death from cholera at the age of 70. Rachel was then appointed his replacement by the Treasury Department. She became the first female lighthouse keeper on the Great Lakes. 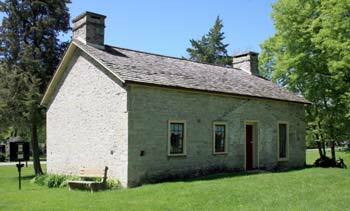 The house is the oldest known residence still standing in Ottawa County and is a fine example of a "hall-and-parlor house," an early American home design. Why is the Keeper's House so far from the the Marblehead Lighthouse? The answer is that Benajah Wolcott was primarily a farmer. The soil on the southside of Marblehead is deeper and more suitable for farming. The trip to the Sandusky Lighthouse as it was called then, was not a difficult journey on horseback, or even walking. Wolcott would remain on duty only as long as required by the responsibilities required by the position. During the winter months when Lake Erie was frozen, there would be no boats and thus no need for the lighthouse beacon. 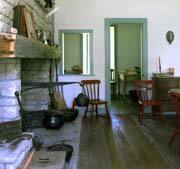 The Keeper's House is open Monday through Friday, 1 to 5 p.m. from Memorial Day through Labor Day. Tours are free of charge. Call the House to get the most up to date information on hours of operation. The house is located on the south side of the Marblehead Peninsula. Across the street is Battlefield Park dedicated to the War of 1812 and just up the road is Johnson's Island, that was once a Civil War prisoner of War camp. The Keeper's House is open afternoons till 5:00pm – call the House to get the most up to date information on hours of operation.